4 months 3 weeks ago	- 4 months 3 weeks ago	#576 by Pascale R.
Auto Start & End Point ... what does that tell the embroidery machine? was created by Pascale R.
HI Everyone! I have a question about the auto start & end points and how it works with my Happy HCD2 1501 machine, I'm not sure if this is a Wilcom or Happy question, so I will post this on the Happy site too. 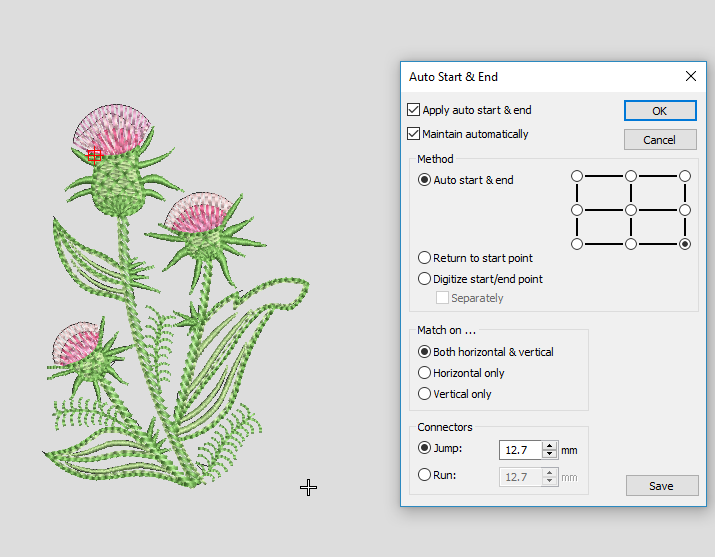 If I set the auto start & end points in Wilcom to the same spot (bottom corner). On machine, I position the hoop so the number one needle is above the start/end point (see blue dot). That's where the trace starts & ends. When the design is finished, the machine doesn't return the number one needle to the start & end point (as specified by Wilcom; or at least, I think that's what the Auto Start & End means in Wilcom). I attached pictures, which hopefully will make better sense. Replied by antony on topic Auto Start & End Point ... what does that tell the embroidery machine? If my understanding is correct, Auto Start & End works with machines that do not auto-centre designs. Assuming your machine works with assigned start and end points, (in your second attachment), is the last stitch using number one needle? 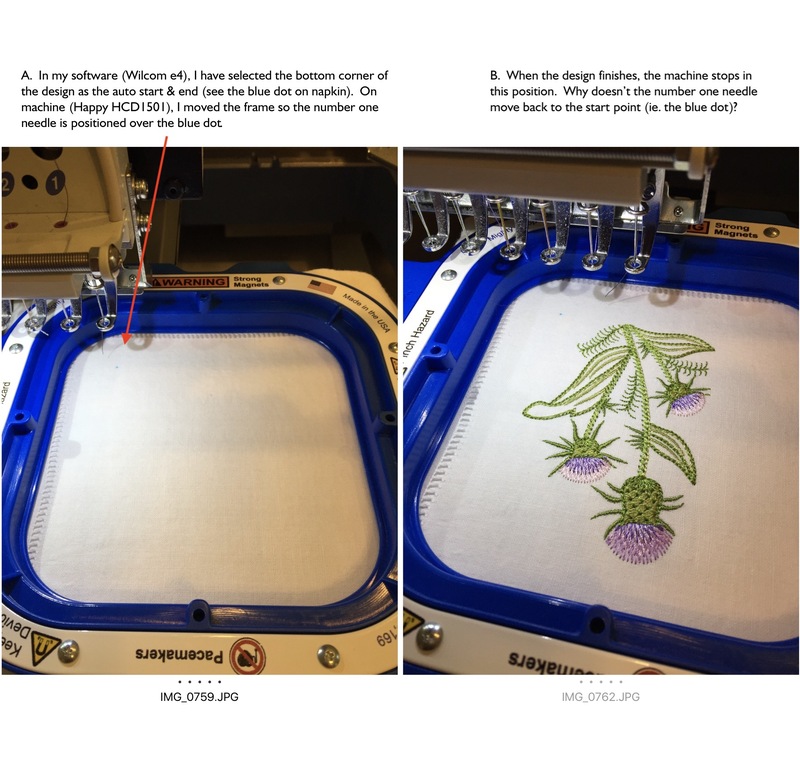 4 months 3 weeks ago	#581 by Pascale R.
Replied by Pascale R. on topic Auto Start & End Point ... what does that tell the embroidery machine? Ah ha! I looked at this again and figured out what the machine did by watching both the screen on machine & the hoop movement. It's all good! Final result: machine returned to the start/end point and aligned needle #3 (which was the first needle used in design) to the start/end point. I thought it was supposed line up again with needle 1 (since that is the needle used to do the initial trace & alignment). I'm glad I figured this out! I was never able to use Wilcom's Auto Start & End with my Babylock EMP6 because it automatically auto centered. I love using the Auto Start & End feature with the Happy! Replied by Sam on topic Auto Start & End Point ... what does that tell the embroidery machine? As far as I know, Barudan machine format can set "Return to Start" for the needle in its machine format setting. With that feature, after stitching finished, machine will return to the starting needle automatically.